Thursday afternoon I was taking one of my favorite Hatha classes. It’s not a class where we focus on tricks or obscure poses, but a class where we deepen our practices. As we moved into Vrksasana (tree pose), and opened our hands to the ceiling, our instructor, Jillian Balzer, invited us to take on spontaneity. “Create some movement in your branches,” she percolated, and we all began swaying our arms in the imaginary breeze. Falling in and out of balance, snickers lifted around the room like budding hope. I couldn’t stop the giggle that escaped me as I wobbled around on my right foot. My leg felt unsteady beneath me, and my arms did not flow gracefully. Instead, I know they jerked around like a toddler’s as she simultaneously tries to move forward and stay upright. It’s not a sensation most adults actively seek out, but in that moment I was thankful for it. I saw a lesson that had been dormant for some time. Vrksasana is one of the first poses I really understood. It’s my comfort pose. When my writing students are nervously taking their quizzes, I sneak behind the podium, raise my left foot up along the right inseam of my slacks, find that “sweet spot” halfway up my femur and press into my supporting leg for a minute. I ground myself. I don’t let their nervous energy take over the room. When the grading becomes particularly grueling, I kick off my shoes and hop over to the meditation space in front of my window. I watch the needley tips of the spruce tree’s branches and draw my breath into my opening hips. A few breaths with my hands at heart center and compassion returns to my palms, stability is restored in my feet and aspirations for my students return to nest in my third eye. There are few moments of home for me, nowadays. Even my daylight hours feel like a whim on the wind sometimes, and my bed, less a place of comfort than a piece of furniture to fall upon on my way into a dream. But when I am on my mat, returning to the poses I’ve been studying and deepening for almost a score, I remember myself at seventeen, at twenty-five, at thirty. I remember the ways I was naïve and the moments when I learned wisdom. Sometimes, I’m caught off guard by the lessons I’ve known so well and forgotten. I try to bring those teachings back into my consciousness, but lately, the way our culture is changing socially, I’ve felt more and more unsettled. I’ve found myself drawn more toward the comfort of my poses than their challenges. I know I am not alone. Our culture has been shaken up so badly in the last ten years. The lessons we’ve taken for granted have uprooted us. I have so many friends who have relocated because of their financial situations; who have taken the kinds of jobs they can get, not the kinds of careers they wanted and who’ve put their relationships and families on hold so they can make just one thing feel solid in their lives. They are sad about it for moment, but then they ground down, find subtle ways to put their talents and dreams to work for them. They create beautiful lives out of thin air. It’s not easy, though, and sometimes they are caught off balance. Sometimes, so am I. It’s more than just a wobble. When we fall these days, we fall harder than ever before. The safety nets have been pulled out from under us. Even as we look outside of our social circles, it doesn’t seem that there is much to hope for. There are few stories on the news that promote the resilience of the human spirit, and many popular books and movies are too dramatic to relate to. And I don’t know whether it’s because it’s an election year, because our economy is unsteady or because our culture is becoming more hateful, but it seems to me that we take our frustrations out on each other more than we used to. I don’t remember these levels of road rage in my twenties. I don’t remember seeing servers and hosts dressed down so frequently (even when I worked in restaurants). It feels like strangers are reaching out to whoever is standing closest and announcing: “If I’m going down, I’m taking you with me.” It makes our losses all the more difficult because we are experiencing the sensation of being attacked from every angle. We have been trained that if we gather the supplies that we need, it will all be okay. However, when the supplies are too expensive or out of reach and when our loved ones are busy putting out their own fires, it’s easy to panic. For me, it’s easy to want to give up, crawl inside of myself and try to wait it out until the winds change. I remembered that even though it didn’t feel steady, my supporting leg had a lot more muscle tone than I had ever stopped to think about. Until then, I had never known the ways in which I had been holding myself up and moving myself forward every single day. I hadn’t known how strong I was; I hadn’t even stopped to think that strength was an option. I’m happy I had a chance to remember it, though, because as I am embarking on this new yogic journey, I’m a little frightened of what might or might not happen for me. I know that inevitably, I will flail my arms a bit, but I don’t have to think of it like that. I can look for moments of grace in the uncertainty. I can send my roots down, remembering that I have one foot firmly on the ground and the other, rising. The other night I was awakened by the sound of the wind lifting the branches outside my bedroom window. The leaves shivered against one another as the wind pushed them away from the diaphragm of the ground and they settled, only to hit another wave of air. The branches were being lifted all at once. It sounded like the wind might seize all the trees in the neighborhood, carrying them north on its current. And yet, there was no blast, no gale, just a soft, powerful, constant movement in the night. I’m an unusually heavy sleeper. Ask my parents; they’ve got stories. (I slept through a fire alarm once in the college dorms.) So for something to wake me at 4:27 AM, it has to be pretty significant. The trees outside my home rustle all the time. There are three larger than my building that line my apartment. Often I don’t even see them anymore except when their leaves change with the seasons. Something had caught me, though, deep in my sleep. It interrupted the fluid motion of my breath and alerted me to the trees. I can only presume that this something was the awareness that I had actually heard the warm front moving in. It had been on the news all week that temperatures would begin to rise Wednesday morning around 1 AM. Meteorologists were warning the people of the Twin Cities to prepare for the five-day stretch. Temperatures, they said, would shift from 50-some degrees Tuesday night to the mid 90’s Wednesday afternoon and stay there through the weekend. The people in my state are used to large fluctuations in temperature, but we’re not used to the high heat. This is an event we see only once or twice a year, and I love it. I want to celebrate it in the foods I cook and the walks I take. I want to enjoy every last second of it. And this year, I heard it coming. I am finally going through my yoga teacher training and part of this is helping me to enhance my meditation habit. 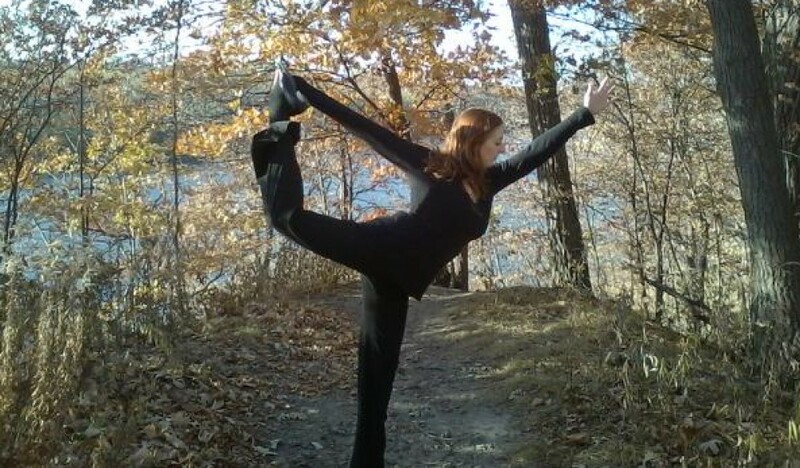 For much of my practice, I had been happy considering only how yoga was working on my body. I reveled in my asanas, I enjoyed the feeling of my lungs expanding and releasing to their full capacity and I was thankful for the calm that movement created on particularly stressful days. However, I had no intention of working through mantras, and I shied away from any chakra talk. I had felt pretty clear that yoga was just an extension of dance. Now that I am cultivating a more traditional meditation practice, I have noticed a shift in my brain. It’s much more difficult for me to read (and respond) to emails and Facebook posts. I look at them, letting the information flow in, but I am paralyzed to send anything out. I feel increasingly like the people who contact me just want to be heard, but because they are all talking at once, I can’t hear a single one of their voices. Their voices seem alike, like the same white-hot screen. (Yes, you are hearing this from a writing instructor, from one who makes a living on detecting and encouraging the individual syntaxes of young writers.) The voices in the emails are quick blasts. There is no way to tell if the senders’ voices are agitated or depressed. The sonic experiences of their expressions are lost in the period which means the same thing when it is pressed in anger or hope. They make the same mild jokes so they can’t be accused of crassness or confused with seriousness. They make concise requests instead of asking thoughtful questions. They are completely devoid of any personal content or connective tissue that might remind me of how I am allied to the senders in the first place. And they don’t come in one at a time. They are waiting in line for me to pull up their numbers. How does a person manage five conversations in just a few minutes? I used to be able to do this with ease. I’d read the email, I’d click “reply,” I’d type my response, I’d click “send.” But now I feel like I am holding my breath. I really want to think about what everyone is saying to me. I want to remember the conversations when I see the senders in person, and I want to show respect to the people whom I love and work with. As I meditate more and more, each email becomes more like the one sent just a minute before. The voices on my computer screen become one voice. It is urgent, almost fretful. And as soon as I respond to it, it boomerangs back at me. It asks for more of me without a thought to the ‘us’ created in what was formerly known as a conversation. I know I am guilty of this as well. Shouting my requests out there into cyber-space, I become anxious when I don’t hear a response right away. I find little tasks (like playing my next Scrabble move) to keep me online until my request is granted. These tasks can’t take too long, though, because I want to check my email every five minutes in case that ‘urgent’ information has traveled through the wind and into my Inbox. I’ve foolishly turned off my ‘email alerts’ chime in case I end up working on a piece of writing (which has never happened). I waste my own time waiting for replies that don’t change much for me in the grand scheme of things. What could’ve been a five minute phone call—one that allows for pleasantries, a little news and the sighs that quietly reveal the joy and suffering we can’t put language to—has turned into a two hour vacuum of crossword puzzles and Bejeweled. When I finally emerge from my computer, my eyes feel dry and tired, and my brain feels a bit dizzy. As I try to stand up, I become acutely aware of just how disembodied I had become. Often times, I still have not received the reply I’d been so desperately awaiting. I don’t want to be on the give and take of this line of communication anymore. I’ve been trying little tricks to stop myself from engaging in this way for the last year or so. But the post-it reminders have fallen off the wall. The timer telling me computer hour was up stopped ringing on its own. The New Year’s resolution was dead by the end of February. I’m not sure if meditation can help me solve this one, but I’m also not sure how much that matters. He makes us the promise that through our willingness to focus our attention on recalibrating our internal voice “…all [our] impurities will be destroyed; and then [we] will gain the light of wisdom…” (II.28). That cleansing and wisdom is possible for each of us every day and every minute. By tuning into the messages our breaths deliver us through the various obstacles in our days, we have a chance to hear our bodies’ interpretations of the new directions our lives are about to take. We begin to hear the possibilities for the people standing next to us or on the other end of the phone. And if we listen close enough, we can hear the earth’s possibilities on the breath of the wind. I was finally awakened to the earth voice. It is breathing the same message it breathed before Patanjali and as it will continue to breathe long after I am gone. I’m sure I’ve been hearing it my whole life. And while in the past, I may have stopped to think, “Wow, that’s really lovely,” I guarantee that I have never asked WHAT the voice was saying. Three nights ago, I heard the message so clearly that it roused me from sleep. It wasn’t cracking a bland joke. It wasn’t avoiding sentiment or requesting anything from me except to listen if I could. The message wasn’t terribly dramatic, but it felt like a gift nonetheless. I didn’t hear the earth’s voice with the aid of any technology. I heard it speaking through its own mouth. The earth exhaled, “Summer is here.” And I received that message with the same excitement as I would feel hearing a newborn baby’s sleeping breath. This event, that I looked forward to all winter, had arrived. But this time, my mind was finally quiet enough to hear it.